My mother’s visit continued to be full o’ fun with Day 2!! We went walking in the morning and then got dressed and ready to meet Christy for lunch at Cosi. After we gobbled our sandwiches and salads, we realized it would probably be polite to buy dessert so we could hang out some more at our table in the quickly-filling restaurant. So I went to the counter with the intent of buying a chocolate chip cookie but then discovered that you CAN actually get S’mores at lunch (I thought it was only at dinner for some reason), so how could I resist? It was a little tricky figuring how to make “S’mores for 2″ work for 3 people but we managed to figure it out. After lunch, Sheils and I motored on to Arundel Mills Mall where, after getting caught up in buying out the entire Bass store for post-pregnancy transition clothes (60% off most everything–HELLO!!?? ), we did lots of walking. Came home, ate leftovers, played Skip-Bo, watched TV since there were actually new episodes, and then crashed. A good day. We had a lovely day of quasi-adventure yesterday. Sheils brought her new TomTom to Maryland so we could use it to figure out how to get to places I never go… you know, like the library and the mall. Seth and I continue to be pro-map people so I doubt there’s a GPS system in our future (that is NOT a hint) but it was kinda fun to see how ole’ Tom (not to be confused with Uncle T-Dawg) told us to get around town. I didn’t like the route to the mall, but I will say that he enlightened me as to a more direct way to the library. So we walked around the mall– made some returns, made some purchases. Shared the Pizzeria Uno lunch special. Each had a bubble tea. Came home, napped. Made a fabulous pot of Winter Minestrone soup from the current issue of Cooking Light (left out the fennel and substituted spinach for the swiss chard for any of you subscribers out there) and played some Skip-Bo. Seth got home from his favorite multicultural class sometime during the Skip-Bo tournament and assured us that watching us play was riveting entertainment. And I’m sure he was telling nothing but the truth. My sweet cousin (and loyal blog reader), Paula, sent me an email the other day that I MUST have my mom bring me a piece of Italian Cream Cake from a certain little bakery in Dallas. It seems that back when Paula was due with her son, my mom and she went to run some errands and then ended up enjoying this same tasty treat. 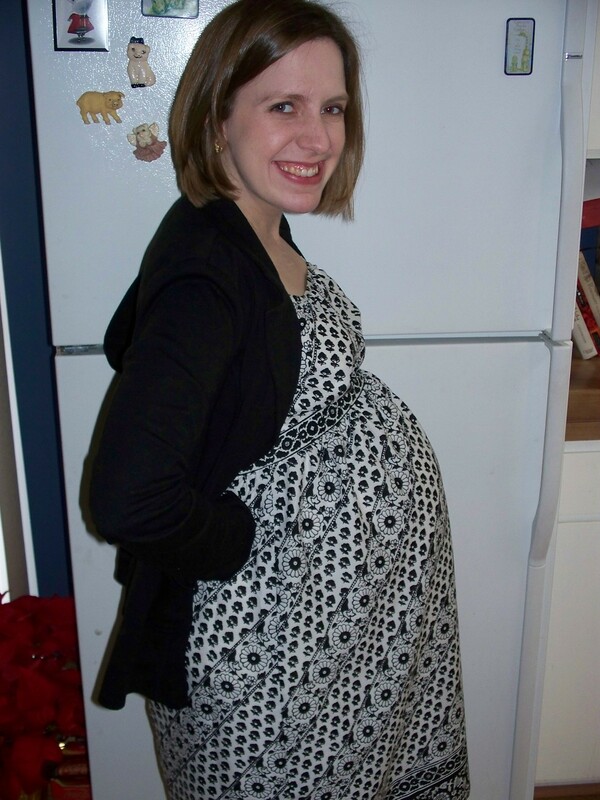 When Paula returned home after the outing and awoke from a nap, she found herself to be in early labor. How could I NOT try the “Magic Cake”? Sheils, of course, came through and brought the piece of cake with her, fighting off the security agent at the airport who threatened to take it out of her bag. After I picked her up, we ran some errands so we could as closely match the previous adventure as possible. (Of course, we ended up having dinner in between but it was Thai for the spice!) We then settled in for me to eat the piece of cake which WOW– sugar overload! It was SOOOO good but for the first time in my life, I actually wished there were more cake to go with all the icing! Am I going crazy?? Needless to say, I’m sitting here blogging so I’m not at the hospital. But I’m not giving up hope!! We’ve always said that I am my mother’s clone, and her first child (also a boy, obviously) was born exactly a week late. So maybe it’ll be Friday…??? In any case, many thanks to Paula for allowing me to have such a YUMMY dessert last night! Pregnancy is starting to hurt my hips. (Birthin’ hips though they may be….I hope!) I’ve always been a “side sleeper” but I suppose that in my earlier life, I could easily end up on my back or stomach as necessary to enjoy a comfortable sleep. With the current focus on remaining on my side, however, I suppose all that weight is bearing down on a hip. I end up switching hips every so often and even got up during the night last night to try to sleep more upright in a chair, but it didn’t seem to help. I generally wake up kinda sore all over that general low-midsection. So, even though all our walking has not proved to be a labor-starter, I really feel like I need to go walking so I can get some movement back in my sore body. Amazingly enough, we are having 60 degree weather with blue skies and sun so I didn’t even have to put on my usual outfit of sweatpants and multiple layers. After one loop around the neighborhood, I cut into the “tot lot” that backs up several of the houses down the street, and had a most enjoyable session on the swings. Swinging was on a list we saw of things that can get labor going so I figured it couldn’t be a bad thing. I have to say– there is nothing nicer than flying through the air with eyes closed in the sunshine and thinking about how great life really is. I hope each one of you has a wonderful day! So much for walking. Amazingly enough, I am really not any further along, dilation and dropped-baby-wise, than I was last Monday. My doctor feels pretty strongly that induction when circumstances aren’t more “favorable” is not in the best interest of anyone and, as much as we’d love to meet Baboo, we feel really good about the medical professional’s opinion! We aren’t giving up hope that he could still come on his own at any point, but we’ve scheduled an induction date of NEXT Tuesday the 15th. Sigh. Sheils arrives tomorrow and I’ve already informed her that her role for her 10-day visit is more likely to be “Emily’s Chief Entertainer” rather than “Grammie.” It will be great to have some company for these long days of not having much to do!! At least we know that the baby WILL be here before she leaves on the 18th. And, thankfully, Seth’s mom arrives on the 19th so we will still have grandmaternal help whenever this baby decides to come meet us. If he doesn’t decide to come out and play today (which, let’s face it, I’m finding more and more likely), then I’ll go to the doctor tomorrow morning for an appointment. We’ll keep you posted. 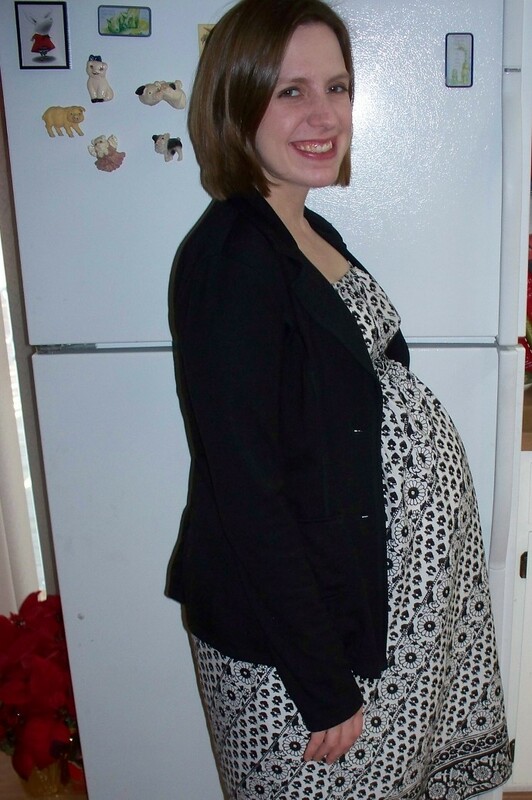 PLEASE let this be the last preggo pic….! The Due Date has Arrived. Baboo has not. He has until the end of the day before we start wringing our hands over a future with a delinquent child. Seriously, I have nothing interesting to say. Now, some of you might wonder why I would still set out to write a blog entry if I have nothing to say. And those of you would probably be correct, but I’m going to stumble ahead anyway. Seth abandoned me to return to school today. He’s mean like that. So I’ve been forced to avoid doing any kind of work all by myself. Christmas ornaments are still strewn around the living room. I’m just not motivated to put them away! I’m bored enough that I keep checking my work email even though I’m on leave already. I have a real problem. Last night, I got really hungry for a Big Mac. I don’t think I’ve ordered a Big Mac in years and years. I managed to convince myself that it was more sensible to eat the pork chops, sweet potatoes, and green beans that we had planned for and that I could reward myself today with a cheeseburger happy meal for far less health damange. So I did and it disappeared way too quickly. Perhaps I should’ve gotten a supersized Big Mac meal after all. I mean, this kid has already ganged up against my pursuit not to gain too much weight by taking his sweet time to come out. Speaking of which, Seth keeps telling him to “swim towards the light” although he never actually holds up the flashlight in order for Baboo to make any sense of that statement. Hopefully, the little one will start to listen to his father soon or we’re in for some rough times. At our appointment on Monday (where things seem to be progressing as they should, just not at a supersonic pace), the doctor commented as he walked in on how I was “still smiling.” I can’t help it. It’s just the way I am. But I might have to stop smiling here pretty soon if things don’t get started! Last night, I broke my streak of being in bed long before 10 pm, and actually went to sleep with 2008 already here. We had a fabulous evening at Kathy’s and Joel’s eating good food and playing games with 11 of our friends. I guess being out and about and surrounded by happy people leads to a less-sleepy Emily so I made it into the wee hours with no problems! So here it is, New Year’s Day. While black-eyed peas and cheese grits are eaten in households across the South (or at least chez Moore) to preserve tradition, we will continue on our path of paving the unique Kenton road in Maryland. We certainly hope that a little one will come join us in the adventure soon…we have a lot to teach him!